The display on the left side will catch your eye. There are two hockey sweaters. One has the name Metropolit on the back. The other reads Daley. 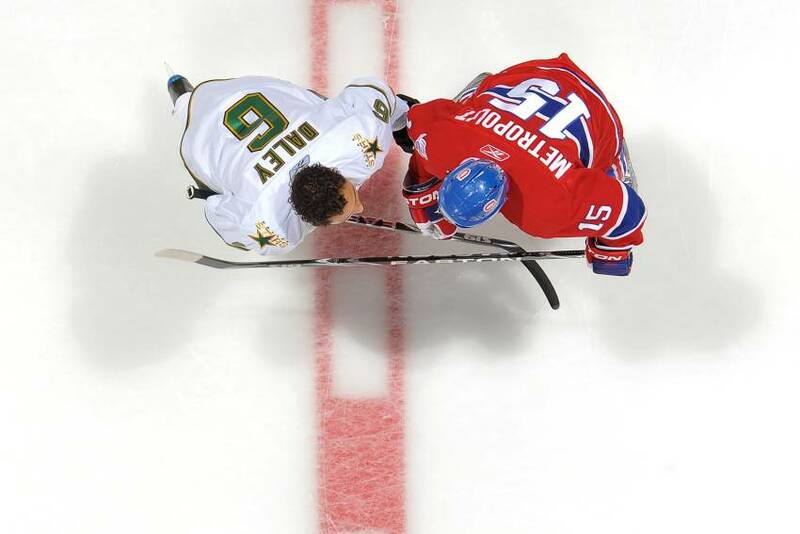 Among the photos that dot the three-shelve tribute, there is one of Trevor Daley hoisting the Stanley Cup as a member of the Pittsburgh Penguins and one of Daley and Glen Metropolit, festooned in their Dallas Stars and Montreal Canadiens uniforms, stretching at centre ice as they chatted before a game at Bell Centre in January of 2010. The display touches on a unique story. Metropolit, nine years older and who retired a year ago, lived in Regent Park. He escaped the trappings of the crime-filled neighbourhood and followed his hockey dream to play more than a 1,000 pro games in North America and Europe. Daley used Metropolit’s story as inspiration and the two-time Stanley Cup champion is about to begin his 14th year in the NHL just 29 regular season outings shy of the 1,000-game milestone. Daley didn’t grow up in Regent Park. His family home was a few blocks east, but when he was younger he would often wind up at either the North or South rinks in Regent Park on cold winter nights to play shinny on the same outdoor surfaces Metropolit used to dominate. “Back then I didn’t know Metro personally, but I had heard about him, heard a lot of stories about him from my uncle,” said Daley, whose uncle Don Harris played junior A with the nearby St. Michael’s Buzzers. Daley was a stick boy with the club as a kid. “[Metropolit] was a guy who came out of that neighbourhood and made it to the NHL,” Daley added. Metropolit, now 44, played a combined 437 regular season and playoff games with the Atlanta Thrashers, St. Louis Blues, Boston Bruins, Philadelphia Flyers and Canadiens. “There had never been a guy to have done that and he was the first. Glennie, for me as an up-and-comer, was my inspiration. Daley, a defenceman with the Detroit Red Wings who turns 35 on Oct. 9, and Metropolit became good friends and remain close today. In 2006, after Metropolit won a scoring title and helped HC Lugano celebrate a Swiss League championship, he was invited to play for Canada at the World championship in Riga, Latvia. Daley was engulfed in the Stanley Cup playoffs at the time, but after his Dallas Stars were eliminated in five games by the Colorado Avalanche in the opening round, Hockey Canada asked Daley to join the national team in Riga. Another special occasion was when the Penguins won their first of back-to-back Stanley Cups in 2016. After Sidney Crosby hoisted the Stanley Cup in celebration he first handed it to Daley. The Penguins captain was well aware of Daley’s story. The latter had suffered a broken ankle in the East final and as he nursed his injury Daley returned home to be with his mom Trudy, who was battling cancer. Even though he was hurt, Daley hit the ice after the final game against the San Jose Sharks to join the party. His mother saw her son hoist the Stanley Cup before she would pass away a week later. Daley tries to visit Regent Park every summer and two years ago he brought the prized trophy back for the neighbourhood kids to see up close and personal. What’s his message to the kids? “To be a good person, never give up and to follow your dreams because you never know what can happen,” he said. Getting another chance to the play for the Stanley Cup? That’s music to Trevor Daley’s ears. His way of getting pumped up for the games? That’s music to his ears, too.